It's the greatest race in the world, or so they'd have us believe. But, since the modifications, the Grand National has become a deeply unpredictable lottery, and far from a sensible punting conveyance. Fine for a bit of a laugh, and an interest, but nothing more. Which is a shame because, in the good old days - you know, like eight or ten years ago - it was actually a pretty solid trends race. It used to be the case that winners had won over three miles-plus, had proven jumping ability, had won in big fields, and had a touch of class. Oh, and they'd lug less than eleven stone. While last year's race was won by a horse - One For Arthur - that was strangely 'gettable', 2016's winner had NEVER finished in front in a steeplechase... And in 2015, a horse a pound off top weight won. The year before, a horse that won a veterans' chase on it previous chase start prevailed. The year before that, the 66/1 winner had chase form of U0P45F5 coming into the race. The average winning SP of the last six winners has been 32.5/1 - and that's after the bookies have squeezed the fleshies of the price of just about every horse in the hours running up to the start! Since 2007, the last eleven years, the average winning SP has been 32.73/1 - a sequence that includes winners at 7/1 (fav) and 100/1. Let's face facts: this is machismo betting; it's vanity punting. The only reason to bet in the Grand National these days is to say, "I had the winner of the Grand National". Better to be lucky than good, right? Seven of the last eleven winners paid 25/1 or bigger at starting price, and 17 of the 44 placed horses (including winners) did likewise. So if you really want to get macho about betting the Nash, exclude all the fancied runners and take four against the field. Horses aged nine, ten or eleven have won 17 of the last 20 renewals. That's 85% of the winners from two-thirds of the runners, and they've had 75% of the places too. [2.018 Update: Two of the exceptions, including last year's winner, were eight. The fourth horse last year was also eight, suggesting that the reduced stamina and jumping test is paving the way for younger horses to further press their claims. So we'll revise this to be horses aged eight to eleven. Lob out any runner rated north of 148 - yes, it's arbitrary (albeit based on the fact that only one 9-11yo managed to win from higher) but I don't care; this is the daftest betting race of the year after all! Will this work this year? Probably not. But is it as reasonable an approach as any of the voodoo ratings agencies, or super trends, or form boffins, or dosage boys'? Erm, probably not. But it's also probably not that far away. There's absolutely no doubt in my mind that the entire complexion of the race has changed since the modifications to the fences. And look at the results since then. It's a tiny sample size and perhaps just coincidence than anything more scientific... but it's not definitely coincidence. During this time, two other things have happened as well: the race is a little bit shorter, and the handicapper has been given discretionary power when it comes to weighting the runners. It is plausible that the latter of those two factors has led to more lenient handicapping of older, seemingly thoroughly exposed, horses. And it is likely that the former has enhanced the prospects of younger, less physically mature types. Tiger Roll (12/1, too short), Seeyouatmidnight (16/1, too short), Regal Encore 33/1, Vieux Lion Rouge 33/1, Warriors Tale 50/1, I Just Know 25/1, Captain Redbeard 25/1, Houblon Des Obeaux 50/1, Milanbar 33/1, Delusionofgrandeur (reserve) 66/1, Vintage Clouds (reserve) 33/1. Removing those too short in the betting and the reserves leaves just seven possibles. 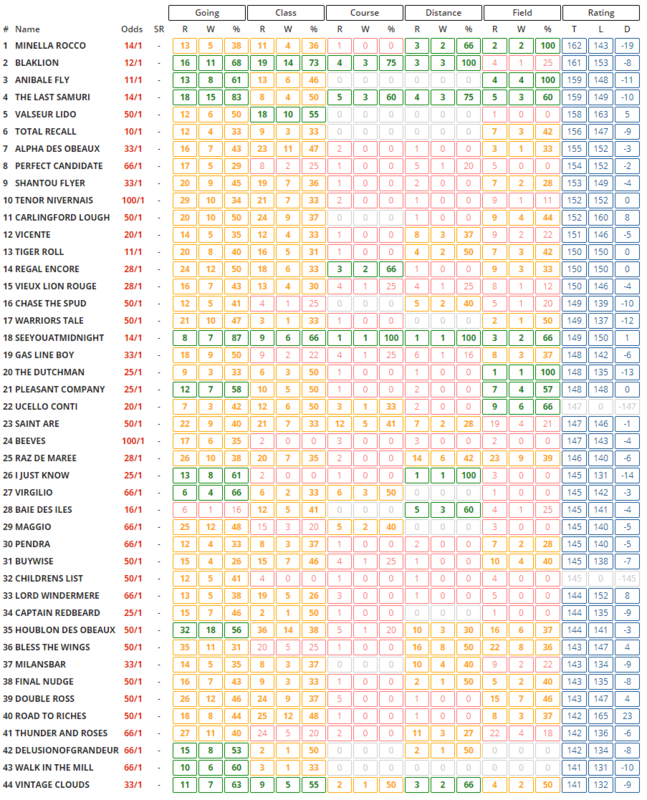 Trying to work out which will start at 25/1 or bigger is something best left to the minutes before the race, but it makes sense to try to steal a march on those which are more likely to go off big prices but are currently very big prices... if you see what I mean. (Let's face it, nothing about betting in this race makes sense, from a financial advice perspective at least, so we might as well have a bit of fun with it). Warriors Tale, Regal Encore, Vieux Lion Rouge, Houblon Des Obeaux and Milansbar look to be the five with a good chance of going off 25/1+. So maybe split your stake between them and see how you go. If betting each way, note that a number of firms are paying SIX places but they are all a fifth the odds the place). bet365 are my preferred option: see why at the bottom of this post. While they are only paying five places, they are a quarter the odds a place, and both non-runner no bet and Best Odds Guaranteed; but they've also got a huge money back offer for EXISTING customers. p.s. This is a standout money back offer for EXISTING bet365 customers. You can bet up to £250 (i.e. 5 x £25 e/w) and receive half your money back as cash (if you bet in cash, as opposed to free bet tokens). That’s a great preview that you haven’t written ! You’ve stolen my thunder, Matt. I was going to make the same points on my own website tonight. Great minds think alike and all that, I suppose. I’ll give Geegeez a plug all the same anyway. Bet365 will be first up against the wall when the revolution comes. But thanks for an interesting article nonetheless, Matt. Good luck tomorrow. I actually remember the morning of the race going through the Racing Post racecard and deleting all the ‘non qualifiers’ to be simply left with just one horse!! Step forward Auroras Encore… winner at 66/1 (or 130/1 as I took on Betfair). Granted the subsequent 3 years has got me nowhere but I am still a believer… or maybe just a fantasist!! Well I don’t give the Gas or the Lodge a hope, but backed Saint Are on Monday with WHill based a report from Tom George saying that he was as good as two years ago when second, Davy Russell booked – and the prospect of good going. 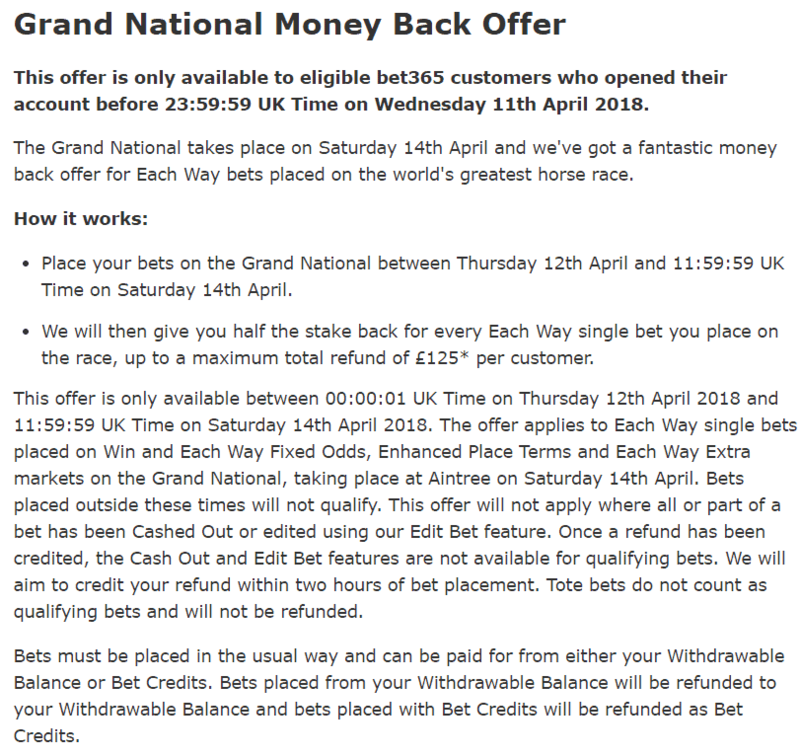 I have had a small bet on Ballynagour (fresh, likes good and related to a GN winner) and am tempted by Stellar Notion with the B365 offer, which gives a place only bet, in effect, with the refund. The one that doesn’t make your cut, Matt, but could arrive refreshed, is Lord Windermere and he ought to be suited by the race, I think. Love this article Matt! I’m willing to go along with the suggestions. £1 e/w on all 7. Can’t do worse than I normally do! That is without doubt the best bookmaker offer I’ve ever seen. Thanks for the tips there Matt. I trusted your judgment and had each way bets on them – very nice returns on Saint Are and Gas Line Boy! Thank you very much! Well done Matt, I backed all 4 in your shortlist. Much better, and easier, than doing the work myself. Thanks for all your knowledge and application. Impressively accurate and I’m glad I followed your advice. Thanks! I was going to write “Bet365 will be first up against the wall when the revolution comes” when I saw someone had beaten me to it. Then I saw it was me, a year ago. Well, at least I’m consistent. I seem to vaguely remember hopping about somewhat dementedly at the fact I’d backed a couple of high-priced placers a year ago, which was most likely down to you, Matt – so thanks for last year, and thanks for the pointers this year. Let’s hope we go one (or two, or three) better this time! 2nd season chases Matt.. that’s the way to go. Forget the old trends. Start new ones from 2013. Good stuff Matt as usual. The Irish National threw up just one trends horse – General Principle, which I backed each way at 33-1 and I have found the winner of that race four years out of six. However, our own Grand National is much more difficult and this year trends have indicated six horses in my book- Blacklion, The Last Samurai, Perfect Candidate, Tiger Roll, Regal Encore and Milansbar who will like the going and is my best guess as to the winner. It is always an achievement in this race if they just get round! Best of luck everybody. Great read as always Matt. I just want to mention an old friend of yours “He ain’t heavy – he’s actually a really good wager”. Four qualify today. Chase The Spud, The Dutchman, Pleasant Company and Final Nudge. I’ve already backed The Dutchman (along with several others), so I’ve gone for the jackpot. Combi forecasts and tricasts. Small stakes obviously. You never know! 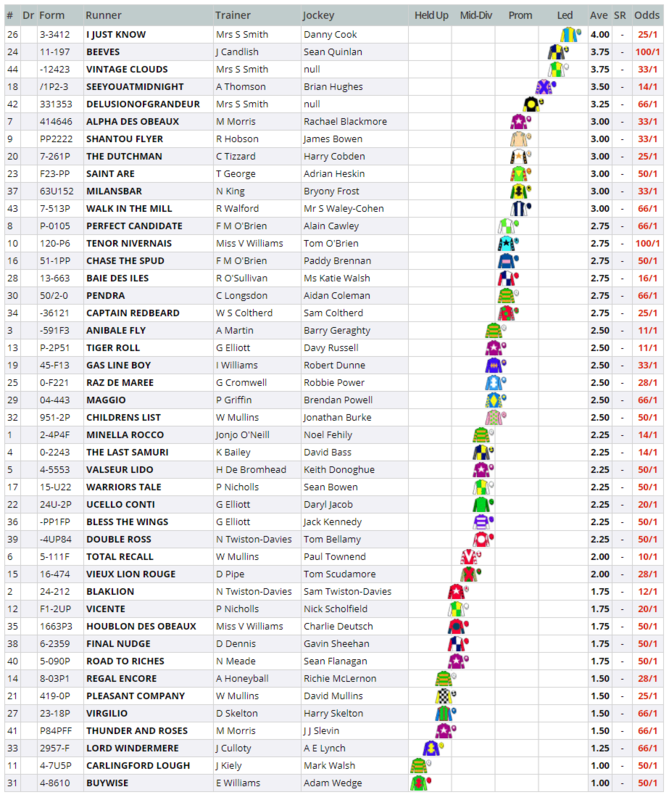 With all these stats it left a short list of six including the winner, Tiger Roll and the fifth, Milansbar. If Tiger Roll had been beaten in the photo by Pleasant Company a review would have been necessary. So it all still applies – roll on next year !! !